June is certainly going to be a great month for Melodic Hard Rock enthusiasts, as German label, AOR Heaven will be unleashing two soon-to-be classics in a few short weeks! I recently reviewed and praised ACACIA AVENUE’s new disc and am doing the same once again for the killer multinational act DEAD END HEROES. The press release states that this project turned band began as a solo album that drummer Daniel Voegeli presented to guitarist Ralph Munkes, who then suggested Carsten Lizard Shulz be a part of it. The opening title track gets things started with a great hard rocking vibe that doesn’t let up for all 11 songs. All players involved are top notch musicians and all help to create some very catchy, hook driven melodic Euro-styled music. I hear elements of WHITESNAKE and EUROPE, but don’t expect a clone of either as DEAD END HEROES definitely put their own spin on things and keep it fresh enough to really spark my interest. Guitarist, Ralph Munkes (I’ve been a fan of his guitar playing for many years) really shines here with some incredible lead work. If David Coverdale takes a listen to his lead work on my favorite track of the album, “Stormfront”, he may very well take recently departed Doug Aldritch’s place! Keyboard player, Holger, Seeger also tears it up here and even though I’m not much of a fan of lengthy keyboard solos, his Hammond playing really adds a lot to the songs. 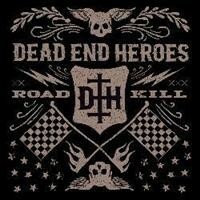 I truly hope DEAD END HEROES get the proper well-deserved push and is heard by fans of Melodic Hard Rock, as they definitely impress with this debut! This disc hasn’t even been released yet and I’m already looking forward to hearing more killer music by them.